Description: Some eight months after the events of Penric and the Shaman, Learned Penric, sorcerer and scholar, travels to Easthome, the capital of the Weald. There he again meets his friends Shaman Inglis and Locator Oswyl. When the body of a sorceress is found in the woods, Oswyl draws him into another investigation; they must all work together to uncover a mystery mixing magic, murder and the strange realities of Temple demons. Penric and his BFF Inglis must solve the murder of a temple sorceress and track down her stray demon before the evildoers escape. 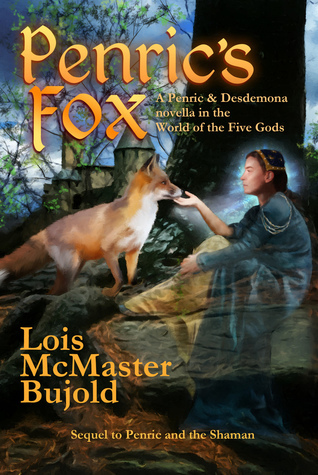 Lois McMaster Bujold flexes her literary muscles once again in this masterful display of short form prose. ‘Penric’s Fox’ is a mystery story not dissimilar from a Golden Age of Mystery mystery story, a la Agatha Christie or Sir Arthur Conan Doyle. Focusing on a non-magical plot, this book triumphs where ‘Penric and the Shaman’ coasted. With clearly understandable motives by both heroes and villains, we are able to fully comprehend what is going on in this plot. Bujold is probably one of the best fantasy authors alive writing the English language. Having recently made the jump from long form novels to short form novellas, her initial short work was not quite up to par when compared to her previously produced materials. ‘The Curse of Chalion’ and ‘Paladin of Souls,’ in my opinion, were some of the best fantasy books ever printed and ‘The Hallowed Hunt’ was no slouch either. ‘Penric’s Fox,’ set in the same setting as those books, compares positively despite its short length. With strong plotting and a focus on characterization, the ‘Penric’ series has become a serial series I am looking forward to more and more with each release. Now for some constructive criticism. Beware minor spoilers ahead! For all the fact that this was a competent mystery novella, it lacked surprise. There were no twists in the plot which are not heavily forecasted, and neither were there any red herrings which one would expect in a mystery novel. Am I picky because I read a lot of mystery books? Probably. But I think this novella could’ve been improved by making the ending not quite so predictable. Part of the fun of a mystery novel is the suspense of the unknown, which this book was light in.